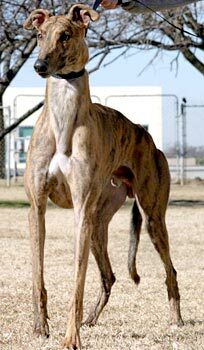 Atom, aka SP's Up N Atom, is a 3-year-old red brindle male, born March 2, 2005. His sire is Coldwater Konow and his dam is SP's Hot Stuff. 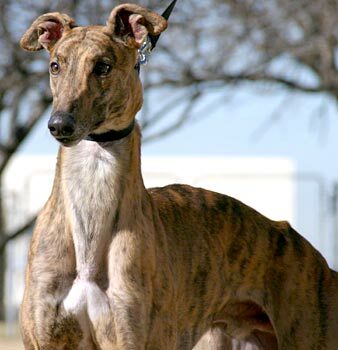 Atom's 11-race career started November 24, 2007, at Valley Race Park in Harlingen, TX, and ended there on January 11, 2008. 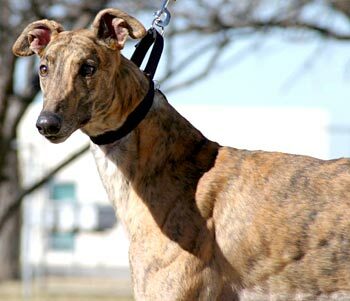 Atom was not a contender in the racing world, but has found his place in the companion pet arena. Atom's cat reaction: Atom wasn't interested in the cat after their initial introduction. Upon first seeing the cat, he was really eager and gave a big sniff with the muzzle, but turned away afterwards. He didn't care about the cat without the muzzle, either. I think that big plastic basket on the dog's face was more irritating to the cat in this case. According to his temporary foster, Atom doesn't pay much attention to the feral cats outside, either. Hopefully he will have a similar reaction to small dogs.